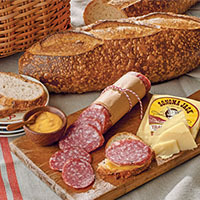 Hearty sandwiches and picnic-perfect selections. Perfect for a Northern California snack. Includes a 1 lb. sourdough long, a 8 oz. Columbus Dry Salame and a 5.3 oz. Sonoma Jack Traditional Jack Cheese. Send someone you love a taste of San Francisco. 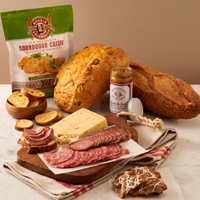 Fresh-baked sourdough artfully hand-scored and shaped in an ever-versatile round, creamy Sonoma Jack Cheese, and dried Italian salame made by Columbus founded in North Beach in 1917. Farmer’s Market Tote full of fresh local Bay Area treats. Includes 1lb. 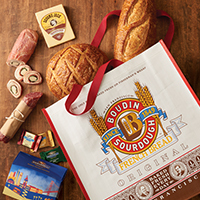 sourdough long & round loaves, an Italian Dry Salame, a Mozzarella Prosciutto roll, Sonoma Jack Cheese & Ghirardelli chocolates, all tucked in our market tote. 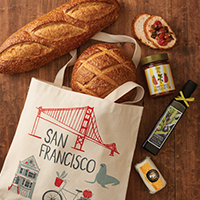 A San Francisco themed canvas tote, filled with local treats! 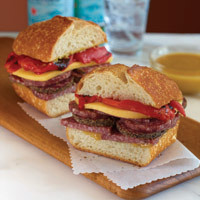 Enjoy a San Francisco North Beach lunch. Receive a 8 oz. 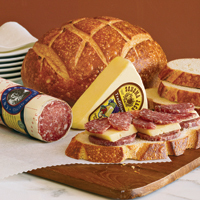 Italian Dry Salame & 10 oz. Peppered Salame from Columbus, 5.3 oz. wedge of Traditional Jack Cheese from Sonoma, 12 oz. Roasted Red Peppers, jar of CA Mustard & 9 sourdough sandwich rolls. 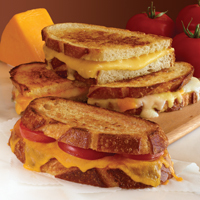 We include not one, but three delicious varieties of California Cheese, plus a 1.5 lb of The Original San Francisco Sourdough round loaf to make the ultimate Grilled Cheese Sandwich. A simple and elegant crowd pleaser! 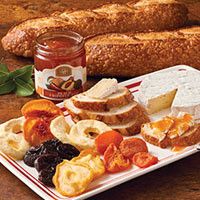 Includes 2 Sourdough gift-sized baguettes, a wheel of Marin French Brie (8oz), Earth and Vine Peach Chipotle and Vacaville Fruit Company Fancy Mixed Dried Fruit assortment).